We’re back to our late-November color pallet of dirt, bark and dead leaves, which, frankly, is a welcome break from Leaf Season and the one-hike-a-year crowd. Leaf Season was on my mind yesterday at Eno River State Park, which is on the northwest fringe of Durham and the Research Triangle. Seemed like every time I turned on my camera and framed an image, I’d be thinking how much prettier it must’ve been a few weeks back. But then I’d see an expanse of shallow, shimmering water framed by stark rows of barren trees with a vivid blue sky above and think: heck, this ain’t so bad. Naked trees aside, the weekend after Thanksgiving is one of the best times to hike around here. Temperatures are ideal for an early lift-off: a bit chilly in the morning but just right in the afternoon. I had sunshine all day yesterday, making it just about perfect. 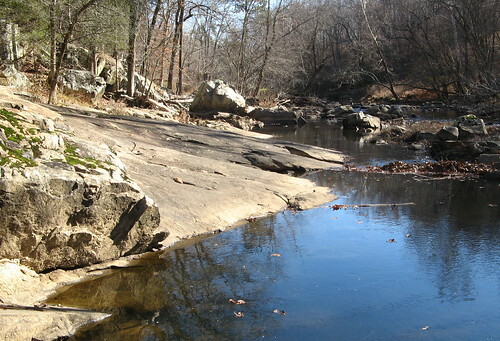 About the park: Eno River is the centerpiece. 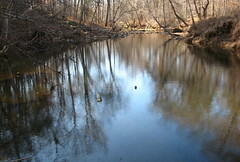 The river feeds a large lake that supplies drinking water for the Raleigh area and can be crystal clear if it’s not engorged with muddy storm runoff. Divided into Eastern and Western sections, the park has over 20 miles of trails and reasonably mild inclines to the nearby bluffs. 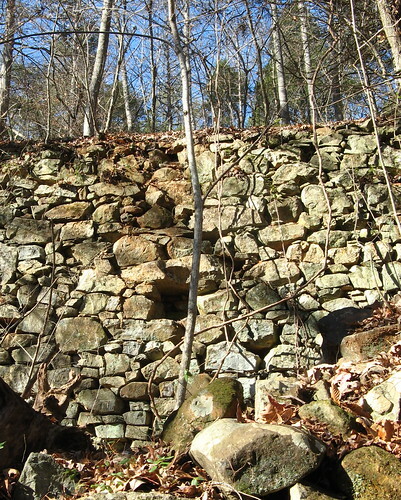 Settlers’ mills were common along the river in the years before the Civil War, and, presumably, the Original Americans plied its waters for thousands of years before that. The Western Section has a bunch of short, easy loops and a suspension bridge spanning the river, which seemed to create the most options for an all-day outing. I strung a few of these loops together for just over 9 miles that hit my hiking sweet spot: not too hard, not too easy. A fisherman tries his luck near Fews Ford, one of several shallow sections of the river that have just enough boulders to tempt the foolish to rock-hop across. A suspension bridge just down the river from here is a much wiser (well, drier) crossing option. 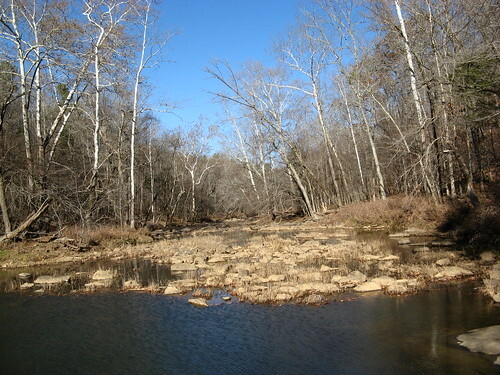 Fews Ford is also the starting point of the Buckwater Creek Trail, a 1.5-mile loop that tracks the river, and then a narrow creek, before heading uphill and back down to the trailhead. This small waterfall is the highlight of the Buckwater Creek Trail. I ended up flopping down on cold rock and fiddling around with frozen fingers before figuring out I’d missed the best light of the morning. Oh well, I came to hike. 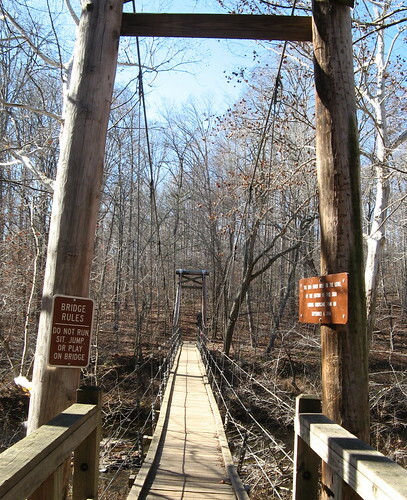 About halfway through the Buckwater Creek Loop, a bridge crosses the creek to the Holden Mill Loop, a 2.5 mile route that offers two options: turning right goes up the bluff next to the river, turning left tracks a creek and then heads up the Eno River. 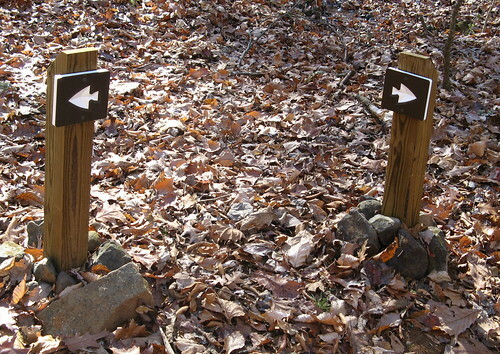 Either way you’ll reach a turn-off to an out-and-back on the Holden Mill Trail. 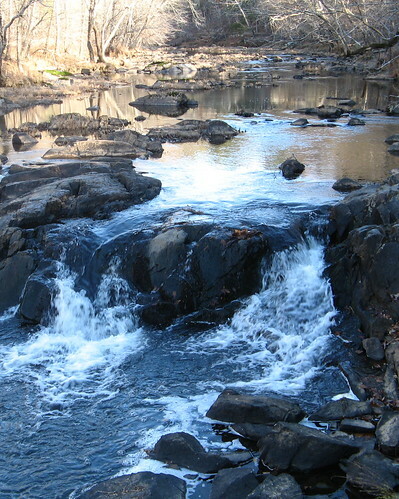 The stretch of trail along the river is rocky and scenic; rugged terrain for this part of North Carolina. 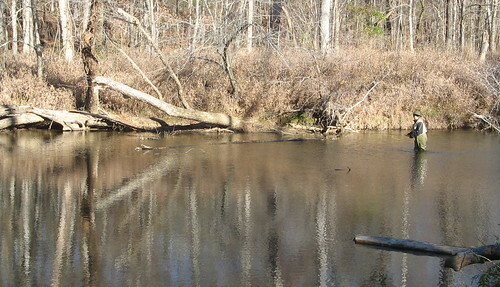 Near a small creek crossing, a sign points to Holden Mill Trail. This, apparently, is what’s left of that mill. It appears that whoever built it cut a channel from the river to direct water to the mill. Once I finished the Holden Mill Loop, I finished the Buckwater Creek Loop and headed downriver to the Suspension Bridge. There’s a fine trail along the water’s edge between Fews Ford and the bridge, but it’s not shown on the park maps. Here’s the Suspension Bridge. Enjoy the bounce on your way across. 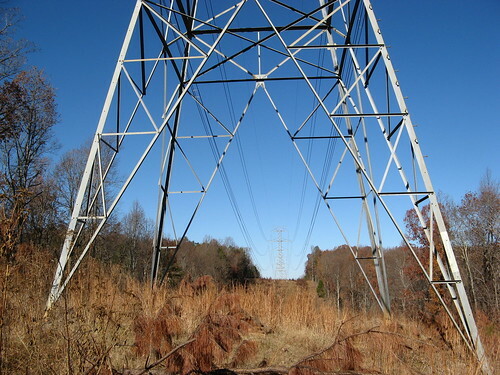 Once across the river, I picked up the Cox Mountain Trail, which goes to the highest point in the park. Calling this hill a “mountain” is a stretch, given that it’s under 800 feet, and there’s not much of a view at the top, but I always feel obligated to visit a park’s highest point if there’s a handy trail. There’s no avoiding these power towers. I passed the cut-out for them four times. Ain’t this always how life is? After coming down from Cox Mountain, the trail returns to the river’s edge. This section is one of the most scenic in the Western Section of the park, but it’s hard to capture with a camera because tree branches get in the way. After finishing the Cox Mountain Loop, I headed back across the bridge and headed downriver a bit further to check out the Eno Trace Trail. It’s a short loop next to a parking lot that attracts the requisite supply of screaming youngsters, but it has a few pretty places along the way. 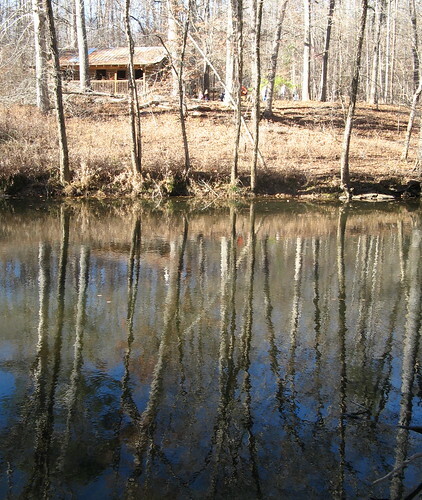 Here’s a view of the Wilderness Cabin across the river. The cabin is contemporary, and offers a nice place to step in out of the sun or rain, depending on your situation. So that’s a look at the Western Section of Eno River State Park. The Eastern Section looks a bit more suburban at a glance, but it’s on the list for further explorations. Very nice river shots. I went ahead and added your blog to http://www.hikingblogs.com. I hiked from West Point on the Eno in Durham to the State Park stayed overnight then hiked out the next morning.I will be glad when they build a bridge on the Eastern section, wading across the river is no fun when it is 40 degrees outside.